As counselors, when we start to venture into private practice for the first time, we make the difficult transition from technician to entrepreneur. The immensity of this transition cannot be overstated. As technicians, we are responsible for our craft—professional counseling. As entrepreneurs, we oversee a much broader set of responsibilities. The change is the equivalent to a pizza dough thrower deciding to open an Italian restaurant. During this transition, many counselors make a fatal error: they assume that running a practice is mostly about doing counseling—about getting their many jobs as a caring counselor done. It’s not. To many in our industry, that statement is blasphemy. Our care-focused culture tells us that to turn our attention to “business” is to undermine client care. In that vein, many of us are taught that if we provide really good clinical care, we’ll make a steady income and the business will grow around us as our just reward. The truth is: it won’t. As a licensed therapist, Dr. Anthony Centore knows that trust is earned, and he doesn’t want you to “take a chance” or “gamble” on this groundbreaking textbook. That’s why he is offering his textbook with a 100% no questions asked money back guarantee! If you do not LOVE this clinical guide—which will help you help your clients—simply return it within 2 weeks and you will get a full refund, no questions asked. We are sure you are going to LOVE the Insider’s Guide as soon as you get it and start reading, and we know it will be an invaluable resource to you and your private practice from start to finish. For less than the cost of one counseling session, you can get the valuable experience that is learning from a leader in online counseling, and learn how to stay ahead of the curve, and build your online counseling practice! Dr. Anthony Centore is the founder of Thriveworks, a counseling company with locations across the United States that’s focused on premium clinical care and customer service that best serves clients and their health. 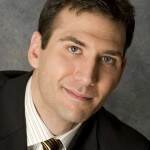 In addition, Dr. Centore is a private practice consultant for the American Counseling Association, a monthly columnist for Counseling Today Magazine and has been quoted in publications including The Boston Globe, Chicago Tribune, Atlanta Journal Constitution, The Monitor, Newsday, Prevention and has been featured on ABC News Boston. You’re trained to be an excellent clinician, one who provides expert care to your clients, but business has never been your “thing.” Or, perhaps you’ve run businesses before, but not one in the increasingly competitive mental health field. In either case, this book is for you. The text includes 29 high-impact lessons that include every key area necessary to build and grow a successful counseling business—this book will help you get it done. It has ZERO filler. Every one of its 45,000 words is selected to deliver maximum impact. Most importantly, this book is written by someone who has done it. Someone whose clinics bring in millions of dollars every year in revenue. Too often “how to build a practice” books and courses are by persons who have barely built a practice of their own, or by persons who were starting to build a caseload once, but failed or can’t repeat a past success. Dr. Centore has profitable offices in multiple states and he knows how to help you make a solid income. How to build a profitable practice will little or no upfront money. How to market your practice, so that you build a full caseload quickly. How to price your services, so that you make the income you need to live the lifestyle you want. In addition to this amazing resource, you will also receive 3 bonus gifts. 1. Dr. Centore’s Forms With your purchase of “How to Thrive in Counseling Private Practice,” you will also receive Dr. Centore’s most requested clinical practice forms. These are the actual proprietary forms used in Thriveworks offices! 2. 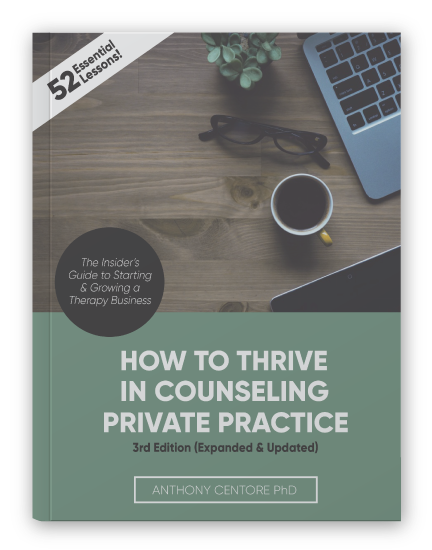 Audio Lecture on Building a Practice to Sell With the Purchase of “How to Thrive in Counseling Private Practice”, you will also receive an MP3 audio-file, narrated by Dr. Anthony Centore, that teaches you how to build a private practice to sell. This may be the most important lesson you will ever hear when it comes to starting a private practice. It is also, the information you are least likely to hear anywhere else! No one is talking about this…but you seriously need to know how to create a business that will one day be sellable to an acquirer. Most counselors have what are known in the business world as “Unsellable Businesses. This means that if a counselor moves, retires, changes careers, or wants or needs to leave his or her practice for any reason, they lose everything. Instead of selling their companies for a tidy sum, counselors are simply rolling them up—locking the doors, shuttering the windows, switching off the lights, and disconnecting the phones. A counselor might say, “After decades of work, do I have nothing to show for it?” This sounds harsh, because it is. This audio file will teach you how to design your practice so that it’s worth maximum value to an acquirer. This can be hundreds of thousands, or in some cases well into the 7-figure range, for a small practice! This cannot be missed! 3. Four Additional Audio Lectures! We can’t help ourselves. The response we received from our course, in 2012, was incredible! But we still weren’t satisfied, and we wanted to provide even more! Building a Positive Culture in Your Counseling Practice! How to Retain your Best Counselors and Employees (and why many counseling practices lose them)! How to Avoid Hiring a Nightmare Counselor Employee! A Step-by-step lesson on ending Client No-show and Late Cancellation Problems!